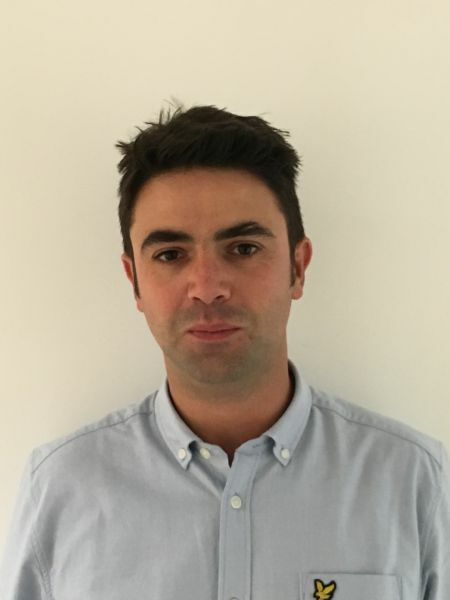 We aim to discover the function of molecular events propagated in chromatin upon DNA damage detection, and question why defects in these events manifest in immune-deficiency and cancer in humans. DNA double-strand breaks (DSBs) are a highly toxic form of DNA damage, which if not properly repaired can result in mutations and genomic translocations. However, DSBs are also required during the specialized recombination events that generate diversity in our immune systems. Accordingly, cellular responses to DSBs are tightly regulated in a cell type and cell cycle dependent manner. Two core regulators of DNA repair pathway choice are the BRCA1 and 53BP1 tumour suppressor proteins. Unlike core components of the DNA repair machinery that interact with or enzymatically process the DNA, these proteins exert their influence indirectly, interacting with large regions of chromatin spanning single DSBs. However, the respective activities of these proteins and nature of chromatin changes that are brought about by their enrichment at DNA damage sites remain undefined. Recent research has revealed that BRCA1 functions to antagonize 53BP1-dependent DSB repair activities during S-phase. Furthermore, an inability to counteract 53BP1 results in the chromosomal instability and tumour predisposition evident in cellular and mouse models of Brca1-deficiency, respectively. Our recent work has focused on understanding the opposing molecular roles of the BRCA1 and 53BP1 proteins in regulating DNA double-strand break repair pathway choice. We have also recently identified RIF1 as the major effector protein during 53BP1-dependent non-homologous end joining, a process crucial for humoral immunity that also drives genomic instability in cells lacking functional BRCA1. Using genome editing, transgenics and a combination of cell biology, biochemical, genetic and proteomic approaches, we are investigating the alterations that occur within DSB-associated chromatin as a result of the activities of these core proteins and other newly identified components of the DNA damage response. Moreover, we hope to elucidate how such changes determine DSB repair fate, to better understand why a breakdown in these processes can result in disease and cancer predisposition in humans. Genotoxic DNA double-strand breaks (DSBs) can be repaired by error-free homologous recombination (HR) or mutagenic non-homologous end-joining1. HR supresses tumorigenesis1, but is restricted to the S and G2 phases of the cell cycle when a sister chromatid is present2. Breast cancer type 1 susceptibility protein (BRCA1) promotes HR by antagonizing the anti-resection factor TP53-binding protein 1(53BP1) (refs. 2-5), but it remains unknown how BRCA1 function is limited to the S and G2 phases. We show that BRCA1 recruitment requires recognition of histone H4 unmethylated at lysine 20 (H4K20me0), linking DSB repair pathway choice directly to sister chromatid availability. We identify the ankyrin repeat domain of BRCA1-associated RING domain protein 1 (BARD1)-the obligate BRCA1 binding partner3-as a reader of H4K20me0 present on new histones in post-replicative chromatin6. BARD1 ankyrin repeat domain mutations disabling H4K20me0 recognition abrogate accumulation of BRCA1 at DSBs, causing aberrant build-up of 53BP1, and allowing anti-resection activity to prevail in S and G2. Consequently, BARD1 recognition of H4K20me0 is required for HR and resistance to poly (ADP-ribose) polymerase inhibitors. Collectively, this reveals that BRCA1-BARD1 monitors the replicative state of the genome to oppose 53BP1 function, routing only DSBs within sister chromatids to HR. 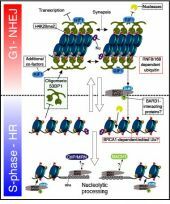 53BP1 controls a specialized non-homologous end joining (NHEJ) pathway that is essential for adaptive immunity, yet oncogenic in BRCA1 mutant cancers. Intra-chromosomal DNA double-strand break (DSB) joining events during immunoglobulin class switch recombination (CSR) require 53BP1. However, in BRCA1 mutant cells, 53BP1 blocks homologous recombination (HR) and promotes toxic NHEJ, resulting in genomic instability. Here, we identify the protein dimerization hub-DYNLL1-as an organizer of multimeric 53BP1 complexes. DYNLL1 binding stimulates 53BP1 oligomerization, and promotes 53BP1's recruitment to, and interaction with, DSB-associated chromatin. Consequently, DYNLL1 regulates 53BP1-dependent NHEJ: CSR is compromised upon deletion of Dynll1 or its transcriptional regulator Asciz, or by mutation of DYNLL1 binding motifs in 53BP1; furthermore, Brca1 mutant cells and tumours are rendered resistant to poly-ADP ribose polymerase (PARP) inhibitor treatments upon deletion of Dynll1 or Asciz. Thus, our results reveal a mechanism that regulates 53BP1-dependent NHEJ and the therapeutic response of BRCA1-deficient cancers. Dynamic protein interaction networks such as DNA double-strand break (DSB) signaling are modulated by post-translational modifications. The DNA repair factor 53BP1 is a rare example of a protein whose post-translational modification-binding function can be switched on and off. 53BP1 is recruited to DSBs by recognizing histone lysine methylation within chromatin, an activity directly inhibited by the 53BP1-binding protein TIRR. X-ray crystal structures of TIRR and a designer protein bound to 53BP1 now reveal a unique regulatory mechanism in which an intricate binding area centered on an essential TIRR arginine residue blocks the methylated-chromatin-binding surface of 53BP1. A 53BP1 separation-of-function mutation that abolishes TIRR-mediated regulation in cells renders 53BP1 hyperactive in response to DSBs, highlighting the key inhibitory function of TIRR. 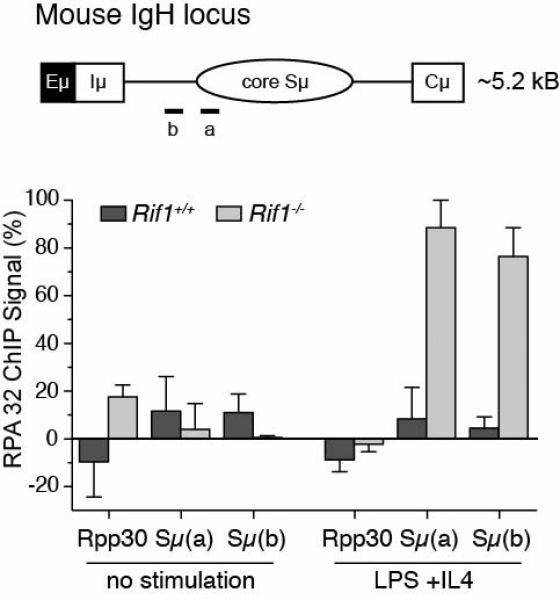 This 53BP1 inhibition is relieved by TIRR-interacting RNA molecules, providing proof-of-principle of RNA-triggered 53BP1 recruitment to DSBs. The Y chromosome is frequently lost in hematopoietic cells, which represents the most common somatic alteration in men. However, the mechanisms that regulate mosaic loss of chromosome Y (mLOY), and its clinical relevance, are unknown. We used genotype-array-intensity data and sequence reads from 85,542 men to identify 19 genomic regions (P < 5 × 10-8) that are associated with mLOY. Cumulatively, these loci also predicted X chromosome loss in women (n = 96,123; P = 4 × 10-6). Additional epigenome-wide methylation analyses using whole blood highlighted 36 differentially methylated sites associated with mLOY. The genes identified converge on aspects of cell proliferation and cell cycle regulation, including DNA synthesis (NPAT), DNA damage response (ATM), mitosis (PMF1, CENPN and MAD1L1) and apoptosis (TP53). We highlight the shared genetic architecture between mLOY and cancer susceptibility, in addition to inferring a causal effect of smoking on mLOY. Collectively, our results demonstrate that genotype-array-intensity data enables a measure of cell cycle efficiency at population scale and identifies genes implicated in aneuploidy, genome instability and cancer susceptibility. The tumor suppressor protein 53BP1, a pivotal regulator of DNA double-strand break (DSB) repair, was first identified as a p53-interacting protein over two decades ago. However, its direct contributions to p53-dependent cellular activities remain undefined. Here, we reveal that 53BP1 stimulates genome-wide p53-dependent gene transactivation and repression events in response to ionizing radiation (IR) and synthetic p53 activation. 53BP1-dependent p53 modulation requires both auto-oligomerization and tandem-BRCT domain-mediated bivalent interactions with p53 and the ubiquitin-specific protease USP28. Loss of these activities results in inefficient p53-dependent cell-cycle checkpoint and exit responses. Furthermore, we demonstrate 53BP1-USP28 cooperation to be essential for normal p53-promoter element interactions and gene transactivation-associated events, yet dispensable for 53BP1-dependent DSB repair regulation. Collectively, our data provide a mechanistic explanation for 53BP1-p53 cooperation in controlling anti-tumorigenic cell-fate decisions and reveal these activities to be distinct and separable from 53BP1's regulation of DNA double-strand break repair pathway choice. Error-free repair of DNA double-strand breaks (DSBs) is achieved by homologous recombination (HR), and BRCA1 is an important factor for this repair pathway. In the absence of BRCA1-mediated HR, the administration of PARP inhibitors induces synthetic lethality of tumour cells of patients with breast or ovarian cancers. Despite the benefit of this tailored therapy, drug resistance can occur by HR restoration. Genetic reversion of BRCA1-inactivating mutations can be the underlying mechanism of drug resistance, but this does not explain resistance in all cases. In particular, little is known about BRCA1-independent restoration of HR. Here we show that loss of REV7 (also known as MAD2L2) in mouse and human cell lines re-establishes CTIP-dependent end resection of DSBs in BRCA1-deficient cells, leading to HR restoration and PARP inhibitor resistance, which is reversed by ATM kinase inhibition. REV7 is recruited to DSBs in a manner dependent on the H2AX-MDC1-RNF8-RNF168-53BP1 chromatin pathway, and seems to block HR and promote end joining in addition to its regulatory role in DNA damage tolerance. Finally, we establish that REV7 blocks DSB resection to promote non-homologous end-joining during immunoglobulin class switch recombination. Our results reveal an unexpected crucial function of REV7 downstream of 53BP1 in coordinating pathological DSB repair pathway choices in BRCA1-deficient cells. The appropriate execution of DNA double-strand break (DSB) repair is critical for genome stability and tumor avoidance. 53BP1 and BRCA1 directly influence DSB repair pathway choice by regulating 5' end resection, but how this is achieved remains uncertain. Here we report that Rif1(-/-) mice are severely compromised for 53BP1-dependent class switch recombination (CSR) and fusion of dysfunctional telomeres. The inappropriate accumulation of RIF1 at DSBs in S phase is antagonized by BRCA1, and deletion of Rif1 suppresses toxic nonhomologous end joining (NHEJ) induced by PARP inhibition in Brca1-deficient cells. Mechanistically, RIF1 is recruited to DSBs via the N-terminal phospho-SQ/TQ domain of 53BP1, and DSBs generated by ionizing radiation or during CSR are hyperresected in the absence of RIF1. 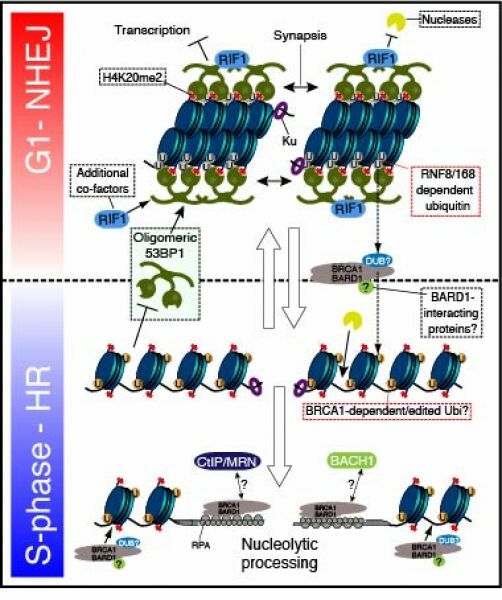 Thus, RIF1 and 53BP1 cooperate to block DSB resection to promote NHEJ in G1, which is antagonized by BRCA1 in S phase to ensure a switch of DSB repair mode to homologous recombination. Following irradiation, numerous DNA-damage-responsive proteins rapidly redistribute into microscopically visible subnuclear aggregates, termed ionising-radiation-induced foci (IRIF). How the enrichment of proteins on damaged chromatin actually relates to DNA repair remains unclear. Here, we use super-resolution microscopy to examine the spatial distribution of BRCA1 and 53BP1 proteins within single IRIF at subdiffraction-limit resolution, yielding an unprecedented increase in detail that was not previously apparent by conventional microscopy. Consistent with a role for 53BP1 in promoting DNA double-strand break repair by non-homologous end joining, 53BP1 enrichment in IRIF is most prominent in the G0/G1 cell cycle phases, where it is enriched in dense globular structures. By contrast, as cells transition through S phase, the recruitment of BRCA1 into the core of IRIF is associated with an exclusion of 53BP1 to the focal periphery, leading to an overall reduction of 53BP1 occupancy at DNA damage sites. Our data suggest that the BRCA1-associated IRIF core corresponds to chromatin regions associated with repair by homologous recombination, and the enrichment of BRCA1 in IRIF represents a temporal switch in the DNA repair program. We propose that BRCA1 antagonises 53BP1-dependent DNA repair in S phase by inhibiting its interaction with chromatin proximal to damage sites. Furthermore, the genomic instability exhibited by BRCA1-deficient cells might result from a failure to efficiently exclude 53BP1 from such regions during S phase. DNA double-strand breaks (DSBs) are highly toxic lesions that can drive genetic instability. To preserve genome integrity, organisms have evolved several DSB repair mechanisms, of which nonhomologous end-joining (NHEJ) and homologous recombination (HR) represent the two most prominent. It has recently become apparent that multiple layers of regulation exist to ensure these repair pathways are accurate and restricted to the appropriate cellular contexts. Such regulation is crucial, as failure to properly execute DSB repair is known to accelerate tumorigenesis and is associated with several human genetic syndromes. Here, we review recent insights into the mechanisms that influence the choice between competing DSB repair pathways, how this is regulated during the cell cycle, and how imbalances in this equilibrium result in genome instability. DNA double-strand break (DSB) signaling and repair are critical for cell viability, and rely on highly coordinated pathways whose molecular organization is still incompletely understood. Here, we show that heterogeneous nuclear ribonucleoprotein U-like (hnRNPUL) proteins 1 and 2 play key roles in cellular responses to DSBs. We identify human hnRNPUL1 and -2 as binding partners for the DSB sensor complex MRE11-RAD50-NBS1 (MRN) and demonstrate that hnRNPUL1 and -2 are recruited to DNA damage in an interdependent manner that requires MRN. Moreover, we show that hnRNPUL1 and -2 stimulate DNA-end resection and promote ATR-dependent signaling and DSB repair by homologous recombination, thereby contributing to cell survival upon exposure to DSB-inducing agents. Finally, we establish that hnRNPUL1 and -2 function downstream of MRN and CtBP-interacting protein (CtIP) to promote recruitment of the BLM helicase to DNA breaks. Collectively, these results provide insights into how mammalian cells respond to DSBs. Human mediator of DNA damage checkpoint 1 (hMDC1) is an essential component of the cellular response to DNA double strand breaks. Recently, hMDC1 has been shown to associate with a subunit of the anaphase-promoting complex/cyclosome (APC/C) (Coster, G., Hayouka, Z., Argaman, L., Strauss, C., Friedler, A., Brandeis, M., and Goldberg, M. (2007) J. Biol. Chem. 282, 32053-32064), a key regulator of mitosis, suggesting a possible role for hMDC1 in controlling normal cell cycle progression. Here, we extend this work to show that hMDC1 regulates normal metaphase-to-anaphase transition through its ability to bind directly to the APC/C and modulate its E3 ubiquitin ligase activity. In support of a role for hMDC1 in controlling mitotic progression, depletion of hMDC1 by small interfering RNA results in a metaphase arrest that appears to be independent of both BubR1-dependent signaling pathways and ATM/ATR activation. Mitotic cells lacking hMDC1 exhibit markedly reduced levels of APC/C activity characterized by reduced levels of Cdc20, and a failure of Cdc20 to bind the APC/C and CREB-binding protein. We suggest therefore that hMDC1 functionally regulates the normal metaphase-to-anaphase transition by modulating the Cdc20-dependent activation of the APC/C. The repair of DNA double-strand breaks (DSBs) is essential to maintain genomic integrity. In higher eukaryotes, DNA DSBs are predominantly repaired by non-homologous end joining (NHEJ), but DNA ends can also be joined by an alternative error-prone mechanism termed microhomology-mediated end joining (MMEJ). In MMEJ, the repair of DNA breaks is mediated by annealing at regions of microhomology and is always associated with deletions at the break site. In budding yeast, the Mre11/Rad5/Xrs2 complex has been demonstrated to play a role in both classical NHEJ and MMEJ, but the involvement of the analogous MRE11/RAD50/NBS1 (MRN) complex in end joining in higher eukaryotes is less certain. Here we demonstrate that in Xenopus laevis egg extracts, the MRN complex is not required for classical DNA-PK-dependent NHEJ. However, the XMRN complex is necessary for resection-based end joining of mismatched DNA ends. This XMRN-dependent end joining process is independent of the core NHEJ components Ku70 and DNA-PK, occurs with delayed kinetics relative to classical NHEJ and brings about repair at sites of microhomology. These data indicate a role for the X. laevis MRN complex in MMEJ. The Mre11/Rad50/Nbs1 protein complex plays central enzymatic and signaling roles in the DNA-damage response. Nuclease (Mre11) and scaffolding (Rad50) components of MRN have been extensively characterized, but the molecular basis of Nbs1 function has remained elusive. Here, we present a 2.3A crystal structure of the N-terminal region of fission yeast Nbs1, revealing an unusual but conserved architecture in which the FHA- and BRCT-repeat domains structurally coalesce. We demonstrate that diphosphorylated pSer-Asp-pThr-Asp motifs, recently identified as multicopy docking sites within Mdc1, are evolutionarily conserved Nbs1 binding targets. Furthermore, we show that similar phosphomotifs within Ctp1, the fission yeast ortholog of human CtIP, promote interactions with the Nbs1 FHA domain that are necessary for Ctp1-dependent resistance to DNA damage. Finally, we establish that human Nbs1 interactions with Mdc1 occur through both its FHA- and BRCT-repeat domains, suggesting how their structural and functional interdependence underpins Nbs1 adaptor functions in the DNA-damage response. Mammalian cells respond to DNA double-strand breaks (DSBs) by recruiting DNA repair and cell-cycle checkpoint proteins to such sites. Central to these DNA damage response (DDR) events is the DNA damage mediator protein MDC1. MDC1 interacts with several DDR proteins, including the MRE11-RAD50-NBS1 (MRN) complex. Here, we show that MDC1 is phosphorylated on a cluster of conserved repeat motifs by casein kinase 2 (CK2). Moreover, we establish that this phosphorylation of MDC1 promotes direct, phosphorylation-dependent interactions with NBS1 in a manner that requires the closely apposed FHA and twin BRCT domains in the amino terminus of NBS1. Finally, we show that these CK2-targeted motifs in MDC1 are required to mediate NBS1 association with chromatin-flanking sites of unrepaired DSBs. These findings provide a molecular explanation for the MDC1-MRN interaction and yield insights into how MDC1 coordinates the focal assembly and activation of several DDR factors in response to DNA damage. Cells respond to DNA double-strand breaks by recruiting factors such as the DNA-damage mediator protein MDC1, the p53-binding protein 1 (53BP1), and the breast cancer susceptibility protein BRCA1 to sites of damaged DNA. Here, we reveal that the ubiquitin ligase RNF8 mediates ubiquitin conjugation and 53BP1 and BRCA1 focal accumulation at sites of DNA lesions. Moreover, we establish that MDC1 recruits RNF8 through phosphodependent interactions between the RNF8 forkhead-associated domain and motifs in MDC1 that are phosphorylated by the DNA-damage activated protein kinase ataxia telangiectasia mutated (ATM). 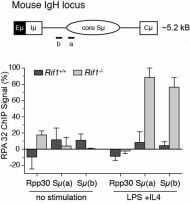 We also show that depletion of the E2 enzyme UBC13 impairs 53BP1 recruitment to sites of damage, which suggests that it cooperates with RNF8. Finally, we reveal that RNF8 promotes the G2/M DNA damage checkpoint and resistance to ionizing radiation. These results demonstrate how the DNA-damage response is orchestrated by ATM-dependent phosphorylation of MDC1 and RNF8-mediated ubiquitination. The DNA damage/replication checkpoints act by sensing the presence of damaged DNA or stalled replication forks and initiate signaling pathways that arrest cell cycle progression. Here we report the cloning and characterization of Xenopus orthologues of the RFCand PCNA-related checkpoint proteins. XRad17 shares regions of homology with the five subunits of Replication factor C. XRad9, XRad1, and XHus1 (components of the 9-1-1 complex) all show homology to the DNA polymerase processivity factor PCNA. We demonstrate that these proteins associate with chromatin and are phosphorylated when replication is inhibited by aphidicolin. Phosphorylation of X9-1-1 is caffeine sensitive, but the chromatin association of XRad17 and the X9-1-1 complex after replication block is unaffected by caffeine. This suggests that the X9-1-1 complex can associate with chromatin independently of XAtm/XAtr activity. We further demonstrate that XRad17 is essential for the chromatin binding and checkpoint-dependent phosphorylation of X9-1-1 and for the activation of XChk1 when the replication checkpoint is induced by aphidicolin. XRad17 is not, however, required for the activation of XCds1 in response to dsDNA ends.